What's Your Business's Customer Service Score? 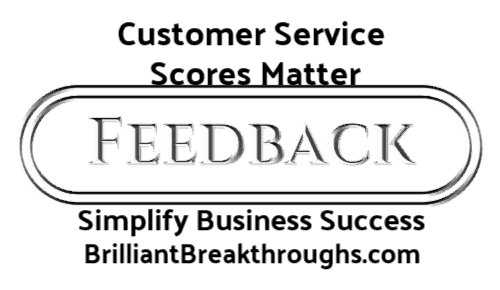 - Brilliant Breakthroughs, Inc.
Home › Customers › What’s Your Business’s Customer Service Score? Your Customer Service Score help you understand what really matters. If YOUR Small Business is like most, you don’t know YOUR Business’s Customer Service Score. You may not even know this is important to YOUR Business’s Performance, nor how to create it. The good news is you are reading this now and can fill this gap with minimal effort. This post is originally being published during Customer Service Week (the first week in October). Do you think this is coincidence? Of course it isn’t. The timing of Customer Service Week is spot on. In September, I tell all my clients to start working on their annual goals for next year. Why? It’s important to know what you’re shooting for so you can plan how to begin the new year with supporting activities. The second reason is October is the first month of the 4th Quarter, or as business abbreviates it: Q4. Q4 has a reflective and wrap-up feel to it. There’s usually a sense of “push” attached to it to complete the year strong. To me it makes perfect sense that Customer Service week is at the beginning of October. It’s essential for Small Business Owners (SBOs) to know and understand their Customer Service Score. It provides opportunities to make appropriate improvements for a strong Q4 and next year as well. What is a Customer Service Score? It’s important to first understand there are two closely related concepts and I don’t want you to mix these up or view them as one. The first is Customer Service. Customer service is now being called Customer Experience (CX): the experience YOUR Customer goes through with YOUR Business or Brand. AKA: How customers are treated. The second is Customer User Experience (UX): the process YOUR Customer experiences with your product or service. AKA: How satisfied they are with what they have purchase from you. What you just read is very cutting edge concepts. Most corporations still aren’t doing this. This is a 21st century business approach and you, SBO, are light-years ahead of the competition if you start implementing this now! NOTE: Usually when people speak of customer service or a customer service score, they are only referencing CX. TIP: When you are reviewing YOUR Business’s Customer Service Score, it is best to include both CX and UX: however, it’s important to keep the scoring separate to make sure you know which area of business is excelling and which isn’t. Next: Make sure you look only at the CX first as you develop what you’d like customers to assess for you. Create a simple, but thorough series of questions and scoring system. Then: Do the same as above, except now you’ll do it for the UX. Last: Per offering/brand, bring the CX and UX together for your analysis. Understanding what YOUR Customer thinks and feels will help you tweak the appropriate things to improve their satisfaction. This may be a humbling experience. If you discover there isn’t as much satisfaction as you anticipated – don’t fret! Own it. Then get busy taking right actions to improve upon what you learned. Be grateful and extend a gratitude gift to those who took the time to share with you that you aren’t nailing it like you could. They will make YOUR Business better if you choose to do make necessary changes. What one little thing could you consistently add to your business to make it golden? Feel free to share what’s going to give you great impact in the comment section. ← Is Business Insurance Necessary?